The British Army had long recruited heavily in Ireland and the two Gloucestershire Regiments, the 28th and the 61st, were no exceptions, but the numbers of Irish recruits had been steadily falling from the 1840s until the outbreak of the Great War. In 1865 the 61st Regiment were posted once again to Ireland, and in July the regiment was engaged in election duty in the Dublin Division. The Independent Irish Party, which had formerly held the balance of power in the House of Commons, had dissolved itself, and most of its former supporters switched their allegiance to the Liberals, who went on to defeat the Conservatives in the 1865 election. In the same year many of the leaders of the Irish Republican Brotherhood, also known as Fenians, and successors to the United Irishmen of the previous century and forerunners of later Nationalists, were rounded up and arrested. James Stephens, founder of the Fenian movement appointed John Devoy as Chief Organiser of Fenians in the British Army. Whatever the facts about the political allegiances of the soldiers of the 61st, they did not mutiny, although some, including Chambers, were indeed arrested, tried and sentenced to long prison terms. The 61st left Ireland in September 1866, briefly stopping over in Newfoundland and Quebec before leaving for Bermuda on 13th October. They were posted again to Canada in 1870, arriving at Halifax, Nova Scotia on Christmas Eve, remaining there until 1872. For one officer of the 61st, Ensign Allan Gilmore, the time spent in North America was a period of great artistic expression. And, in 1871, John Devoy was released from prison, and exiled to the United States. Fenianism had spread across the Atlantic, although the Fenian Raids that were made from American soil against Canada between 1866 and 1870 were well away from the stations of the 61st. One unintended result of these ultimately unsuccessful raids was to help instill a sense of nationhood in the peoples of Canada, who were to affirm their loyalty to the Empire, and develop their own separate identity. 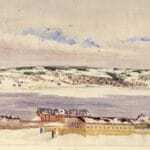 Picture: View of Dartmouth from Wellington Barracks, Halifax, Nova Scotia, March 22nd 1872. Painted by Ensign Alan Gilmore, 61st Regiment. Original in Soldiers of Gloucestershire Museum Collection.